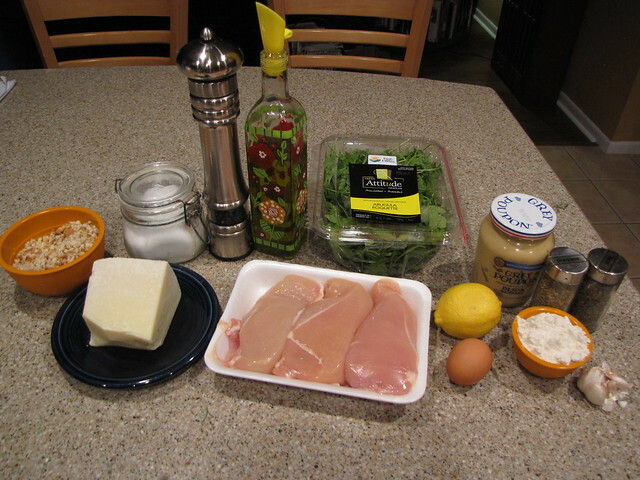 I can’t believe that in the 5 years I’ve had this website, I haven’t posted this recipe for Chicken Milanese. It’s one of my favorite dishes and certainly in the top 5 chicken dishes that I make…if not the top 3. 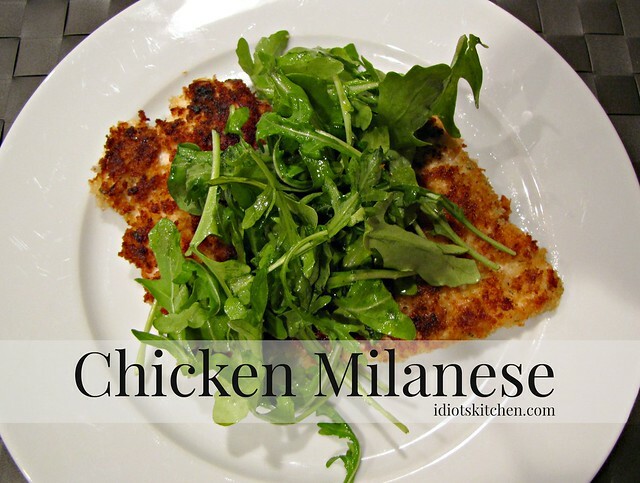 You probably know that anything with Milanese in the title refers to a cutlet, breaded and fried. Where THIS Milanese differs is in the tangy, mustard coating beneath the breading. Flavor galore! I top mine with a simple arugula salad and try not to eat more than my fair share. 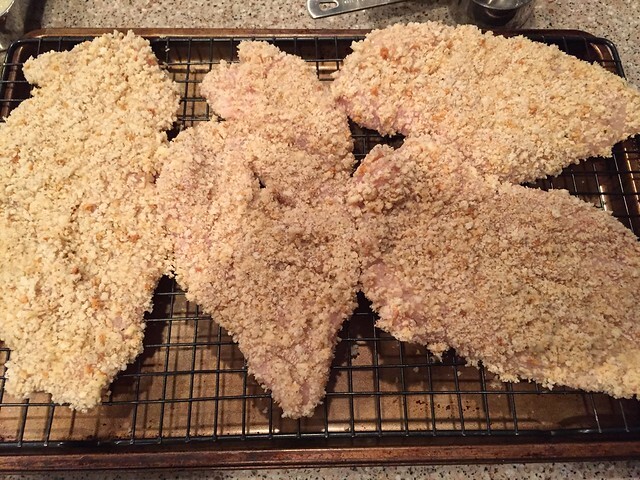 There are a few steps in the breading process (I made my own Gluten Free breadcrumbs) but other than that, this is a pretty simple and straightforward dish. 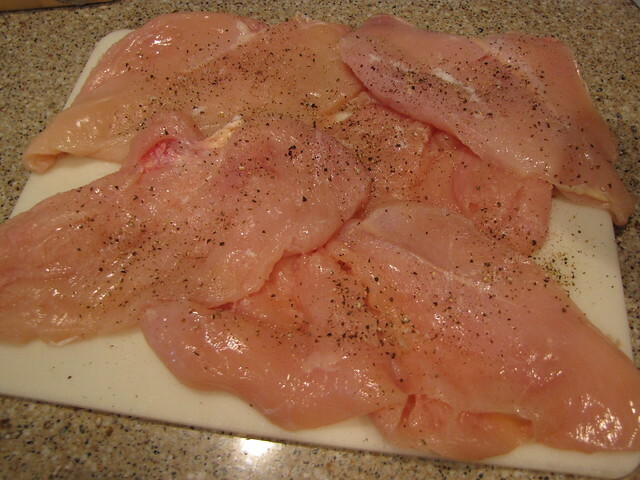 I have 3 of our old faithful friends – the boneless, skinless, chicken breast halves. 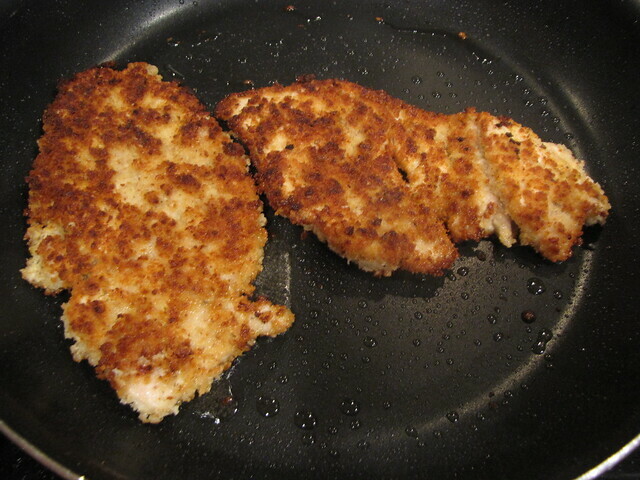 If you tire easily of boring chicken breasts, you should try making them into quick cooking little cutlets. The method here is similar to our Sesame Ginger Lime Chicken where splitting and pounding the chicken breasts slightly thinner lets them cook quickly without drying out. 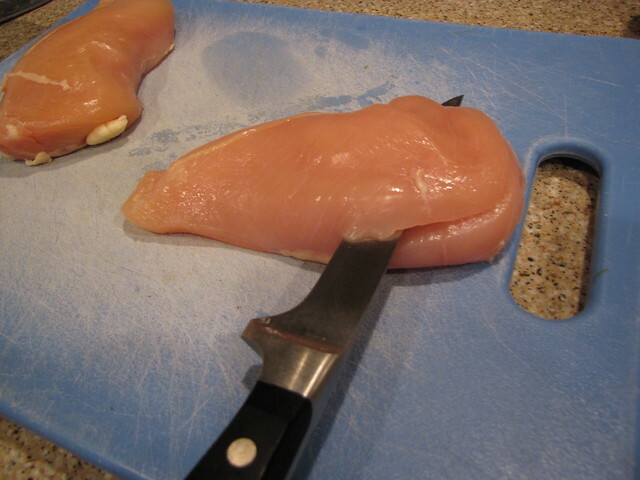 Run a sharp knife horizontally through the chicken breast to make 2 thinner cutlets. I haven’t shown it here, but if you place your hand flat on top of the chicken, it will keep it from shifting around on your board. 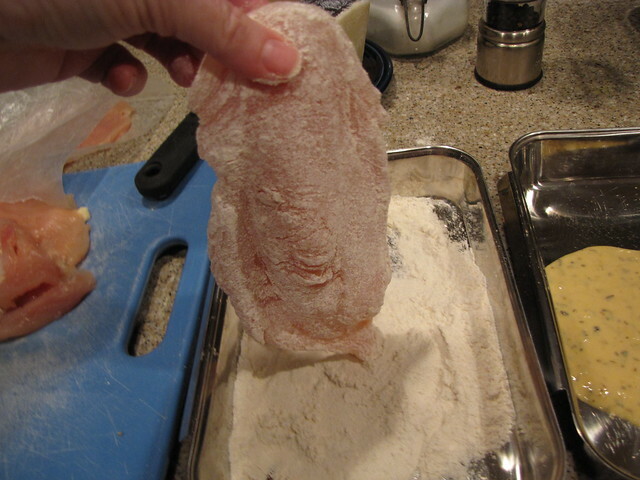 Place the chicken cutlets one at a time in a ziplock bag or between two sheets of waxed paper and use a meat pounder (not the spiky side), rolling pin, or heavy can to pound the chicken to a uniform thickness of about ½ inch. The reality is that you are just pounding out the thicker end of the chicken to match the thicknenss of the pointy end. Don’t pound these super thin or they tear and fall apart. Just pound them evenly flat and you’re good to go. If you are a “normal person”, you can use store bought bread crumbs. Panko is best but regular will work too. 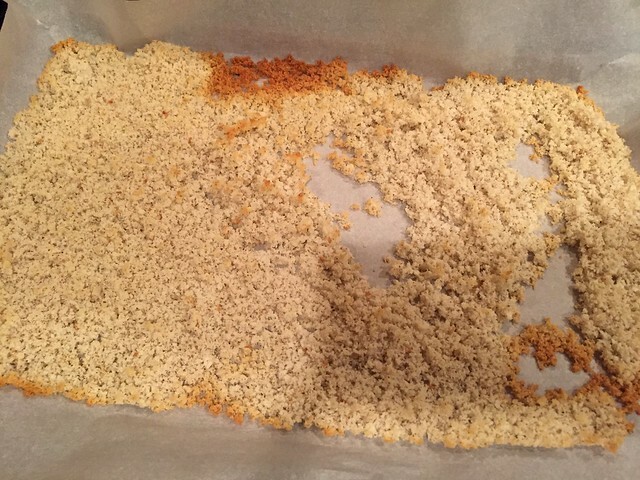 If you are gluten free OR if you just want BETTER breadcrumbs, you can easily make your own. I save bread ends and stale pieces in a bag in the freezer just for this purpose. 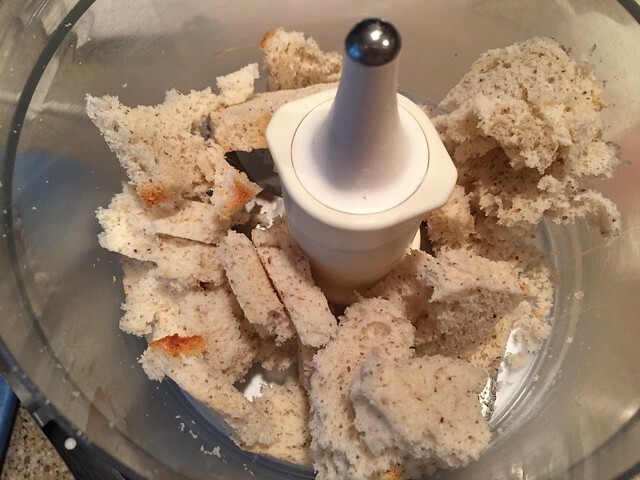 If the crusts are hard, I cut them off, rip the bread into smaller pieces, and pulse it in a food processor until you have crumbs. Place them on a baking sheet and bake them at 350 degrees for 10-15 minutes or until they are golden and crispy. I started doing this because GF breadcrumbs are ridiculously expensive. However, once you start making your own, GF or otherwise, you’ll quickly discover how much better they are than the store bought crumbs. You can store the extras in a baggie in the freezer for another recipe. As I mentioned earlier, what takes this Milanese recipe over the top is the mustard coating. Separate 2 eggs and place the whites only in a small bowl. 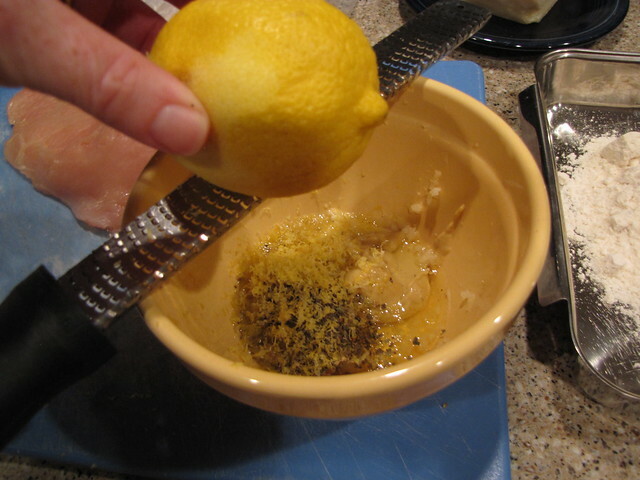 Add 4 Tablespoons of Dijon mustard, 3-4 minced garlic cloves, 2 teaspoons of dried oregano, and the zest of 1 lemon. Stir to combine. Save that lemon for the dressing for the arugula. 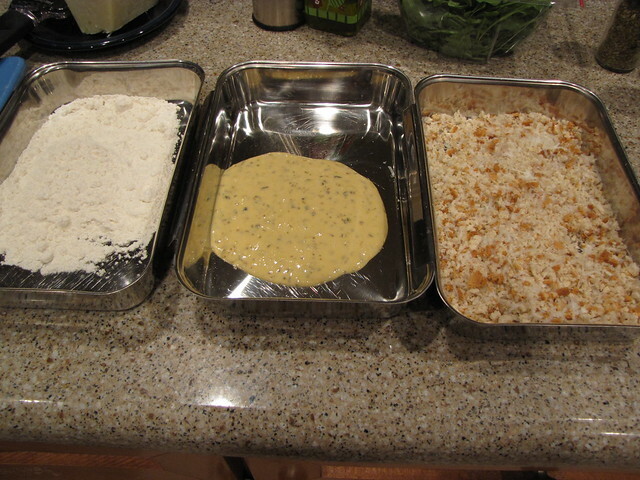 Set up a breading station with 3 plates or shallow pans. The middle pan is for the mustard coating but put ONLY about 2 Tablespoons in the pan at first (more on this later). The third pan is for about 2 cups of bread crumbs. Sometimes I add a little grated parmesan cheese to the breadcrumbs but that is totally optional. 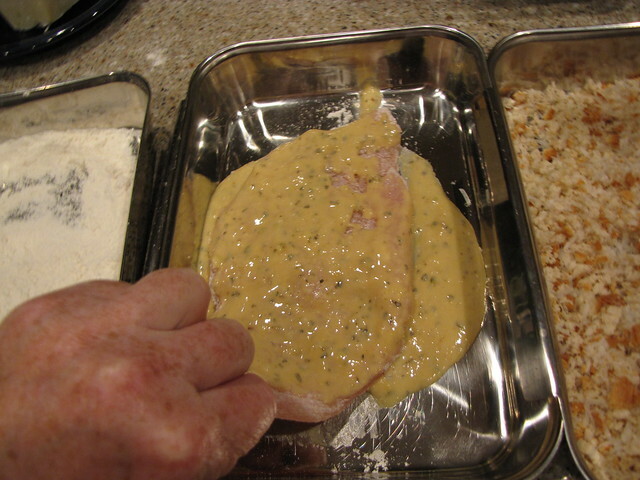 Take a chicken cutlet and dredge it in the flour, shaking off any excess. The chicken will soak up ALL of your mustard sauce so now I put the chicken in the pan and spoon 1-2 Tablepsoons of sauce over the chicken. Use your fingers to spread the sauce around on both sides of the chicken. I’ve had to double the mustard sauce from the original recipe and even with that change, if you aren’t careful, you’ll run out. 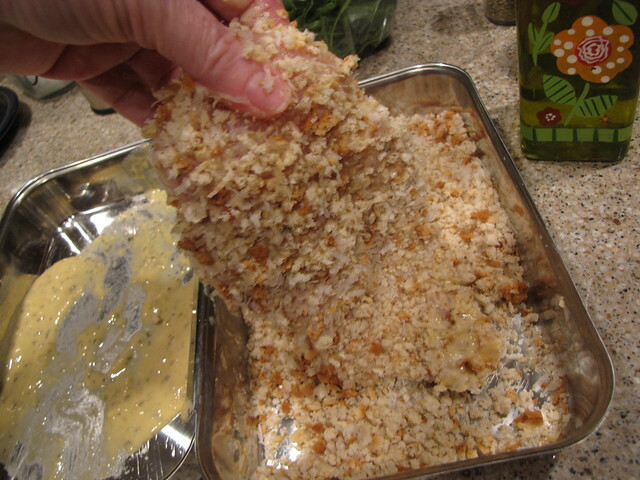 Scrape any drippy mustard sauce off the chicken and then dunk it in the breadcrumbs. You’ll need to press down a bit and help the crumbs adhere to the chicken. A tray fitted with a cooling rack is a great tool for holding the chicken breasts until you’ve finished all of the breading. If you have time and space, the breading will be even better if you can pop these into the fridge to chill for a bit. The original recipe said 1 hour but I’ve never come close to waiting that long. Preheat your oven to 175 degrees so it will be warm for holding the chicken. You want to eat these right away so be sure anything else you are serving is ready to go. Heat 1/2 inch of oil in the bottom of a non-stick skillet over medium high heat. As you know, I’m not huge on frying and I’ve tried this with less oil without much success. I always end up adding more and more oil so I think it is best just to start with a good coating of oil in the bottom of the pan. 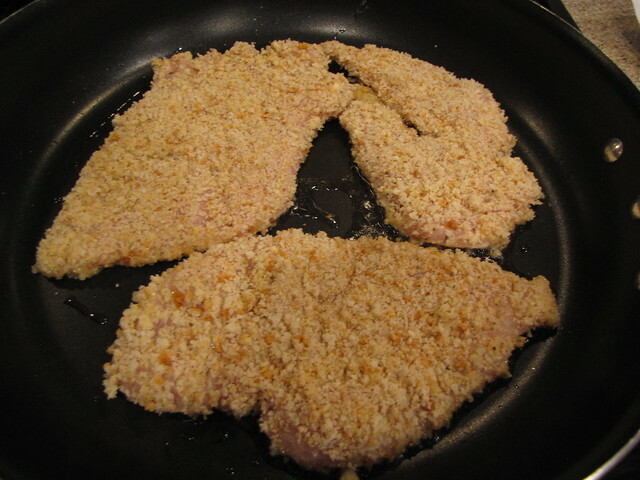 When the oil is hot and wavy (or hisses when you add a droplet of water to the pan) add 2-3 of your chicken cutlets and cook quickly, only 3-4 minutes on the first side. Turn the chicken over and cook for an additional 2-3 minutes until they are golden brown and cooked through. You can always make a small cut to test for doness until you get a feel for how hot your oil is. Remove the cooked cutlets from the pan and drain quickly on a few paper towels to absorb any excess oil. Place them on a tray (again with a rack if you have one) in the oven and repeat until all of your cutlets are cooked. As good as this chicken is on its own, it’s even better when topped with a simple arugula salad. I plan on a big handful of arugula per person and simply toss it with a little olive oil and the juice from the lemon. That’s it! 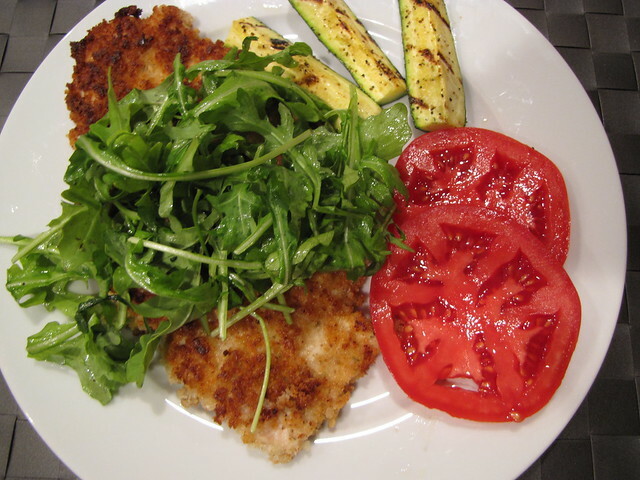 Put a golden cutlet on a plate & top with the arugula salad. I added a few sliced, ripe tomatoes and some grlled zucchini spears. You could also add a few shards of parmesan cheese to the top of the arugula salad. This is absolutely one of my favorite dinners. The bonus is that these basic Chicken Milanese cutlets, could morph into a pretty killer chicken parm with the addition of a slice of fresh mozzarella and some marinara sauce. And if you want a chicken sandwich, this is a great place to start. I am not the usual consumer of leftovers in our family, but I will fight it out for leftover Chicken Milanese! I have made something very close to this for many years. I use whole eggs, though. Everyone loves it, and YES, it makes great chicken Parm! 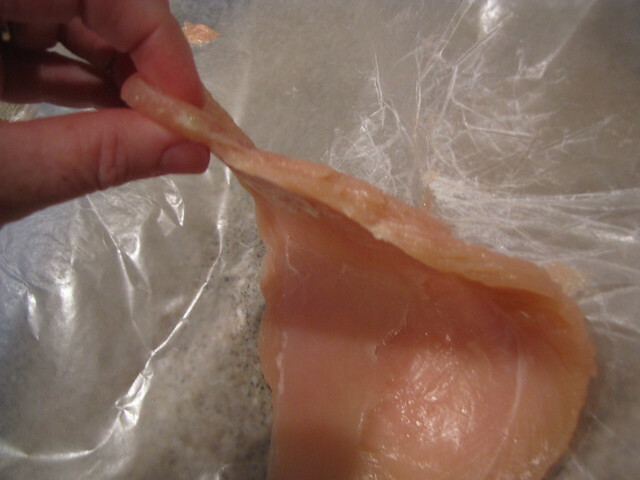 Albertson’s has thin sliced chicken filets which make it even easier for me. OK, this is going back on the menu next week! Claudia, in the 50 years I have lived in this country, you are the ONLY and BEST COOK (besides ME of course) that I have ever known! Keep up the good FOOD! Home cooked! Bistro Meals! And your heart and soul is in it!